Designed to brave the elements and withstand rain, wind and snow, our teardrop banners are durable and rotate with the wind. 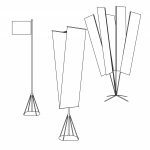 Unlike traditional flags that collapse and lose visibility in low wind conditions, teardrop flags remain taught with full visibility in all conditions. These indoor/outdoor banners are an excellent way to advertise your business or brand, either at retail locations or in the field. 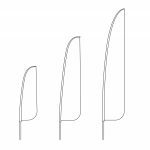 Choose from our most popular shapes and sizes, or let us work with you to create a custom shape that fits your needs. 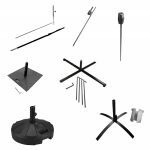 Our range of flag stands allows you to choose the height and configuration that will provide the greatest message broadcast based on your location. Our customizable graphics will fully satisfy your brand’s identity or promotional offer. 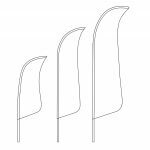 The temporary nature of flag stands, versus traditional sunken or bolted poles, makes them an ideal solution for retail storefronts, outdoor festivals and event wayfinding. 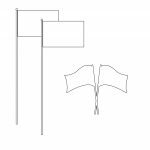 A variety of accessories are available to ensure greater stability or ease of portability of your banner or flag for any given use or environment. With quick and easy setup for instant advertising, our sharkfin banners bring your event to life and improve your graphic exposure. This banner responds like a flag, moving in the direction the wind is blowing. If you need signage that will stand up to the elements, our mesh banners are for you. Our custom-made mesh banners have small interwoven fibers, which allow the wind to pass right through, extending the life of your banner and your message. 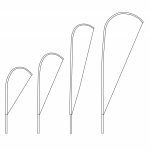 Unique designs and rotating poles allow our pole flags to withstand weather while effectively delivering your message. Available with or without a horizontal top bar to help keep flag from falling close to pole. Reverse face and double sided printing options are available. Our playa banners have a unique shape that instantly draws attention. 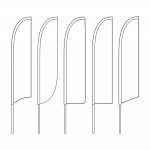 Quick and easy to set up, the distinct playa banner is perfect for both indoor and outdoor events. We are your go-to source for vinyl banners in any dimension and any way: grommeted, double-sided, screen printed…the possibilities are endless. Larger size banners can create barriers for contestants or pedestrians and can be seen from a distance, while smaller sizes can be used for a table display or weatherproof signage. Available in a variety of sizes and representing hundreds of international locations and organizations, our flags are finished to your exacting specifications including colors and graphics.